Native to Thailand, Sumatra, Malaysia, Borneo, Java and Burma, this species is distinctive for its fleshy, flattened inflorescence that produces sequential flowers, each spike flowering for several years and carrying 6-12 waxy and beautifully fragrant 5 cm flowers. This superb alba clone is uniquely greener in appearance than the traditional yellow alba form and immediately captured this author's eye from across a 50' greenhouse. 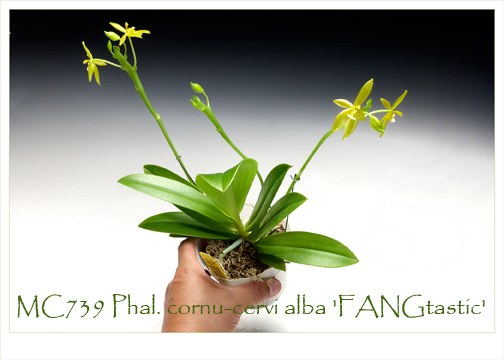 A prized "must" for every species collector for its beautiful yellow-green color, fragrance, ease of growing and ever-blooming nature.